I love, love, loved An Ember in the Ashes when I read it last year. 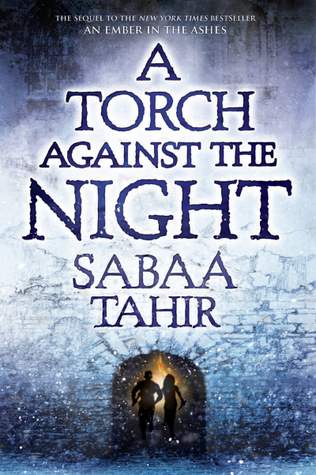 So I happily waited for 2 hours to get a signed ARC of A Torch Against the Night at BEA this year. And it was worth it. I really enjoyed this book. But...I didn't like it as much as An Ember in the Ashes. I don't have a particularly well reasoned explanation for that. Part of it is that the book throws you into the action without giving you time to recall the plot and characters from the previous book. I actually like that. I hate wasting time being reminded of a story I already know. But in this case I had forgotten a lot of things and it took awhile to figure out what was going on. We get a deeper understanding of all the characters here. I particularly liked getting to know Helene better. She's really stuck between a rock and a hard place. She has loyalty to Elias, but also has to serve as the Blood Shrike to the horrible Emperor Marcus. Marcus is making a great evil villain in that he is, well...evil...and more importantly he's clever and basically puts Helene into some very difficult quandaries. Both Elias and Laia's characters are more fully explored here. Like a lot of reviewers, I find Elias more compelling and more sympathetic a person. I feel like he's had to overcome more. Which really isn't logical, because Laia has suffered greatly and overcome a lot too. But something makes me want to root more for Elias. They both do their share of stupid things in this book, although you can understand their rationale. The book doesn't shirk away from violence or from killing its darlings. I respect Sabaa for making brave choices with the plot and characters. Another plot device this book skirts is love triangles. A few were introduced in the last book and they are mostly resolved in this book. In that any possibility of a love triangle is mostly averted. Even though it took me some time to get into this book, it was gripping and a great addition to the series. I'm looking forward to reading more. Recommendation: Buy the whole series! I didn't like it as much as the first book either, but I mostly blame my unreasonable expectations and the romance. Objectively, the book is wonderful and so well done. But I know what you mean about the beginning! It took me a while to get into it too.